Two parents and their child enjoy a dining experience with Nibble+squeak. A dining club that tries to make it easier for parents to go to restaurants with their kids is coming to Philly. Nibble+squeak will hold its first brunch in Philly at 10:30 a.m. on Saturday, Dec. 9, at Wm. Mulherin’s Sons in Fishtown. It's the first of four upcoming events in the city for a club that's been helping adults and their "pipsqueaks" enjoy a dining experience together in New York, London, Los Angeles and handful of other major American cities. The idea behind Nibble+squeak is to minimize some of the challenges parents face when they take their young ones with them out to eat. 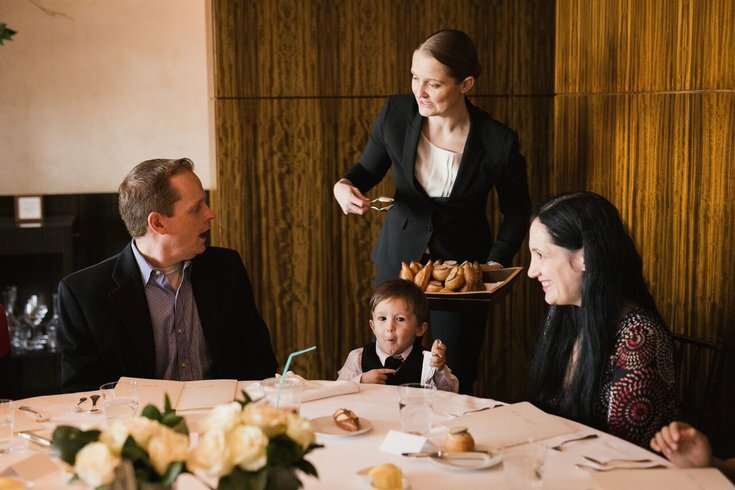 Parents pay for tickets to a restaurant that's chosen based on both its food and its accessibility for guests of all ages. The company then tries to accommodate the rest of parents' needs when they take their children out with them. "The team considers all of the key details that matter to parents, including high chairs, changing mats, stroller parking and, most importantly, like minded people with whom to connect and dine," the company said in a press release. At Nibble+squeak events, either the entire restaurant or a private space is rented out so parents don't have to worry about bugging other diners. It's all part of the service's effort to "empower young adults to enjoy sociable lifestyles post-parenthood." Tickets for the inaugural Philly brunch at Wm. Mulherin’s Sons are $52 for adults without alcohol, and $68 for those who want a beer or cocktail. Children younger than eight eat for free. The next three Nibble+squeak in Philly are scheduled at Barcelona Wine Bar (January 14, 2018), Balboa Supper Club (February 2018) and A Mano (March, 2018). For more information on Nibble+squeak's Philly events, click here.